Posted June 25, 2015 by cmeadmin & filed under Uncategorized. The Australian Energy Regulator (AER) has rejected SA Power Network’s (SAPN’s) proposal to charge households with rooftop solar higher prices than they charge households without. An exciting day for the tariff tragics amongst us. Others might ask why the big fuss – households don’t see the network charge (retailers absorb it and then pass it on, not necessarily in the same way that they charged). Stick with it, sweating the details will reward. SAPN suggested that households with rooftop solar should pay higher prices than non-solar households because it said their evening peak demands are a few watts higher than households without solar. The AER said the difference is not meaningful (or demonstrated) and so SAPN’s argument for discriminating between households with and without PV on this basis does not pass muster. They have invited SAPN to sharpen their pencils and try again. Whether or not solar households’ evening peak demands are a few watts per hour higher is not the point anyway. The bulk of the cost of a distribution network is not in its residential feeders but in its zone and distribution substations and in the higher voltage ring mains and meshed network. It simply does not matter whether households with rooftop PV consume a little more in the evening than households without PV. In fact if you look at the situation more closely you find that a quarter of South Australia’s households with solar panels on their roofs are getting no credit for the third of their PV capacity that is producing electricity at the time of the simultaneous peak on SAPN’s network. It is at the time of this simultaneous peak demand that, by definition, the network is being used to the greatest extent. “Cost reflective” tariffs should mean lower not higher network prices for households (or businesses) with PV, whose panels inject electricity into the grid in the opposite direction to the prevailing flows, when it is most needed. So, why then did SAPN propose to raise prices for households with PV? Quite simply households with PV consume less electricity from the grid than they did when they did not have the panels and SAPN wants to get back as much from them as they used to. This has nothing to do with “cost reflective” tariffs. It is about the recovery of SAPN’s historic expenditures (and SAPN’s profits thereon). SAPN is not alone in this. Figure 1 below compares how the average price for network services for households with PV compares to the average price for households without, with this difference expressed as a percentage of the network tariff. Source: Rooftop solar PV and network tariffs: Information and discussion. Prepared for UnitingCare Australia. 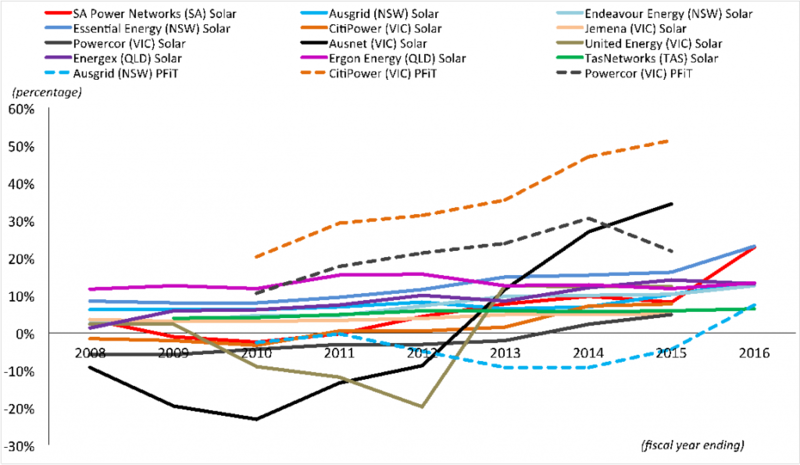 The tick-up in SAPN’s proposed solar tariffs for 2015/16 (the red line) is visible. But it is also clear that SAPN is not the worst offender and that other distributors have been at this game – particularly AusNet and CitiPower in Victoria – for some time. CitiPower in particular charge households with PV that receive the premium feed-in tariff (of which I am one) about 50% more than they charge households without PV. Also, to SAPN’s credit, unlike other distributors, they are not trying to foist higher fixed charges onto households with PV, but have instead proposed higher variable charges. Even if SAPN has erred in setting higher prices, they have at least proposed an economically sensible price structure. The AER’s decision to reject this solar network tariff is a first. But AusNet Services, CitiPower, Powercor and AusGrid have discriminatory network tariffs for Premium Feed-in Tariff recipients. AusGrid’s was at one time “cost reflective” and so meant lower network prices as it should. The Victorian distributors went the other way and AusNet Services persists with a significantly adverse network tariff for solar customers, as Figure 1 shows. The AER will now need to direct its attention to those distributors who are clearly discriminating against households with rooftop solar, whose tariffs the AER has in the past approved. Prices, when you look at them carefully, can tell you so much. The distributors’ attempt to charge PV customers more, is a reflection of the challenge that the industry is facing of technology change (PV and soon also batteries) that is providing consumers with the opportunity for greater self-sufficiency. Many are grabbing this opportunity, as they should, and long-standing monopolies are being undermined. This technology change is occurring after the distributors have been on a protracted spending spree, vastly augmenting network capacity that is now not needed. 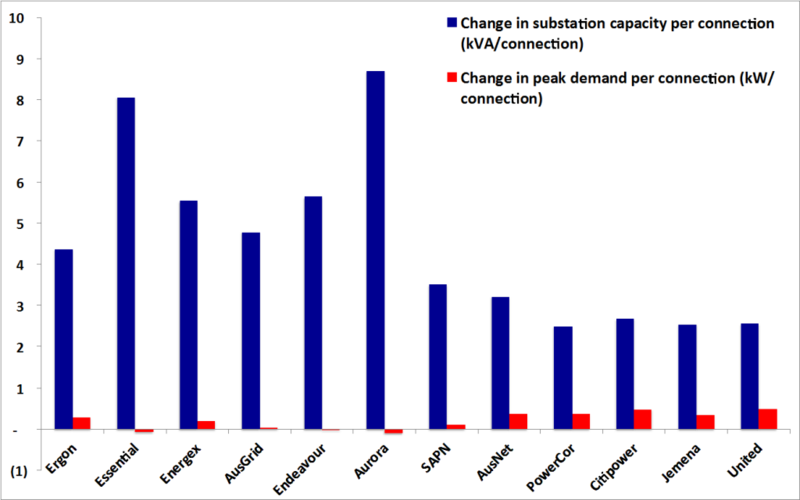 Figure 2 shows the additional substation capacity that distributors in the National Electricity Market installed between 2006 and 2013 and compares it to the change in demand over this period, both expressed per connection. Many economists have spent their lives thinking about regulatory arrangements that try to prevent outcomes such as this. 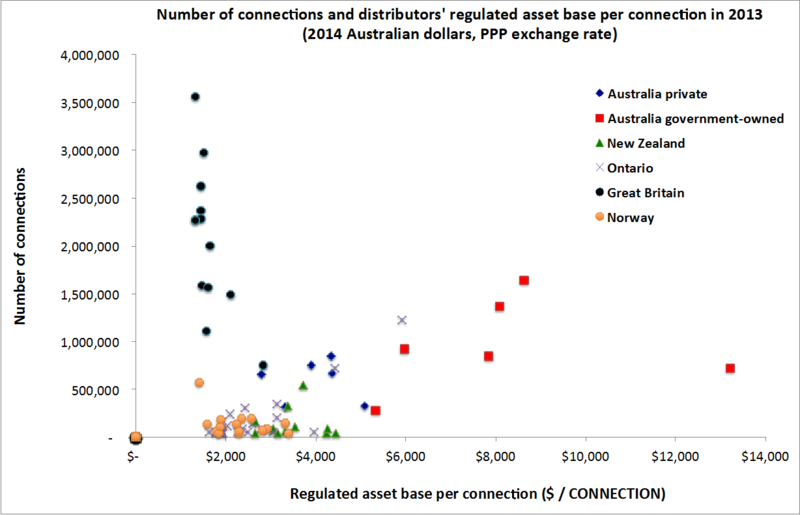 Such massive expenditure (in combination with the other capital expenditures) has left Australia’s distributors – particularly its government-owned distributors – with regulated assets per connection far above those of peers in other countries as shown in Figure 3. Network service providers like to characterise the problem as one of subsidy to free-riding households who have installed PV. It is understandable that they would want to characterise it that way, they are losing business to those customers that are going their own way. The distributors are right that there is a subsidy, but it is not to households with PV. The subsidy is from consumers to distributors allowing the distributors to profit on many years of deeply wasteful expenditure. Mistakes of the past should not be allowed to undermine economically sensible futures. The AER’s decision to reject SAPN’s discrimination against households with rooftop solar is a welcome first step in the right direction.